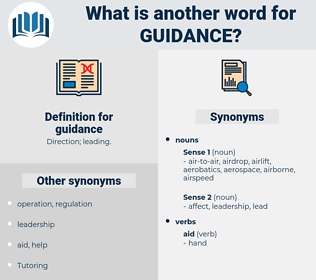 What is another word for guidance? designations, Paths, trends, Goals, instructions. introductions, procedures, particulars, enquiries, lessons, complications, trends, positions, norms, Inquiries, centres, hints, causes, topics, drivers, prompts, Attorneys, Trustees, governors, Lawyers, LFS, processes, Goals, instructions, reference, references, steering. specifications, insights, guideposts, leads, Cues, thrusts, signposts, circles, pointers, signs, particulars, trends, Attorneys, instructions. prompts, aegis, Focuses, Foci, clarification, reference, Aimer, orienting, steering, insight, Tutoring, persuasion, Advising, orienteering, guardianship, 'orientation, input, feedback. advised, directed, supervised, led, governed, Provided, Steered. advised, instructed, Helped, directed, assigned, outlined, led, Issued, mandated, Provided, given, required, modified, driven. 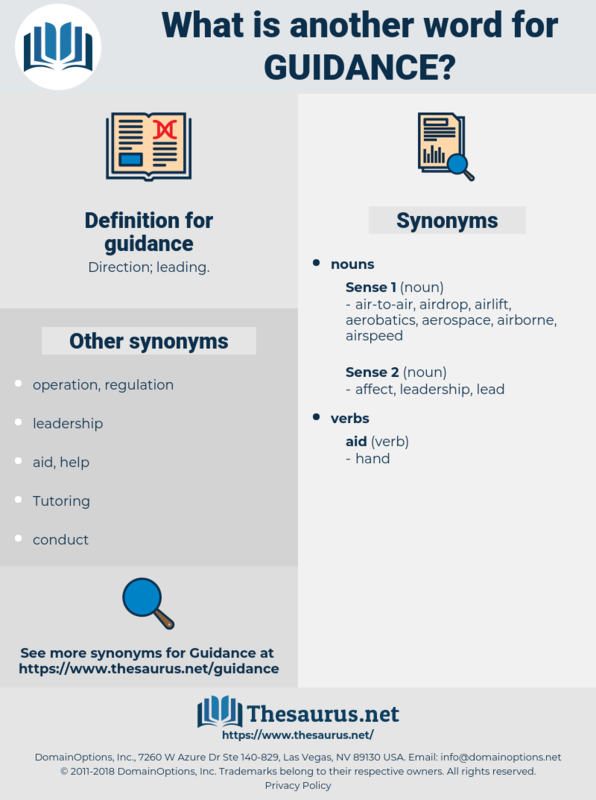 directs, regards, governs, refers, leads, relates, Drives, instructions, reference, references. guide, direction, counselling, guidebook, guideline. orientation, Orientations, guide, direction, counselling, guides, counseling, instruction, guidebook, guideline. orientation, guide, stewardship, direction, counselling, Channelling, counsellor, counseling, address, inspiration, instruction, guidebook, guideline. conducted, ordered, guide, guides, guideline. orientation, guide, counselling, guides, guidebook, guideline. The car started off under Winona's guidance. But Mrs. Baines had loved her, and she had been the one person to whom Mrs. Baines looked for support and guidance.